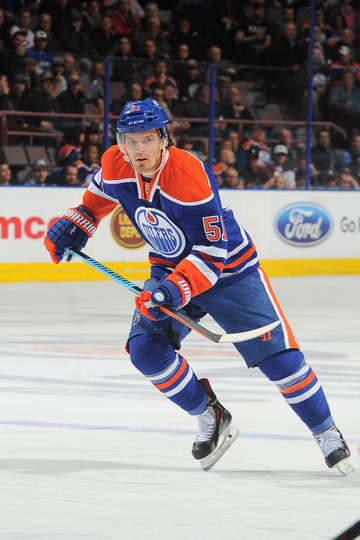 Great signing by the Oilers today locking up centerman Anton Lander for another two years. Next year’s roster will have him, RNH and Gordon at center. That leaves room for one more centerman, but I’m hoping the Oil load up down the middle and shift one or two to wing. The signing of Lander means there’s a good chance that Leon Draisaitl (hopefully) starts in the AHL next season, which is ideal considering his age and potential. It also sets up a nice comparable to use when the team negotiates with Derek Roy. Roy has more experience, for sure, but I don’t think he has as much speed and skill as Lander. Now I’ve been a fan of Lander’s since he was drafted by the Oilers in 2009. The stories about him coming out of Sweden were very encouraging, and we heard lots about his leadership potential. Copper and Blue is a fantastic source for this kind of stuff and they had a very fair assessment of Lander and what his potential might be in 2009. To me, he sounded like our next Horcoff: two way centre to play against tougher competition. Six years later, he’s starting to look like that type of NHL player. And he saves hockey teams in his free time. It really was just a matter of time before Lander established himself as a legitimate NHL player. He had a good junior career and did well in the AHL, even being named team captain for OKC at that young of an age. His production at the AHL level (107 GP, 28 G, 49 A, 77 PTS) meant he should be able to transition into a versatile, third line center who could help on the powerplay and penalty kill. He won’t win you games, but he won’t lose you games either. The reality was that Lander did not have legitimate linemates prior to this season and was often given tougher zone starts with those weak linemates [Copper and Blue]. Now a good team would either let a player like Lander develop in the minors first OR start him at wing before transitioning him to center OR shelter him from tough opposition. The Oilers did none of that and decided to throw him into a position they thought he would end up in sometime in his career: bottom six. What irks me is the fact that the Oilers decided to hang on to young Leon at the start of the season, basically leaving one spot open for either Arcobello or Lander. Draisaitl was of course sent back to juniors a few weeks after Eakins was fired and only after his rights were traded out of Prince Albert, The timing was perfect for Lander as his coach from OKC was now in charge and Pouliot had found some nice chemistry with Eberle and RNH, pushing Hall down a line to pair up with Lander. A lot of credit should go to Nelson for helping Lander find his game in the AHL and the NHL. But we also have to keep in mind that there were a number of things that Oilers management did to stall and then facilitate Lander’s transition to the NHL.